Though I prepare a variety of South Indian Kuzhambu, my all time favorite is of course, Vatha kulambu.This is a very traditional and authentic South Indian (Tamil) recipe.You can prepare this with manathakkali (black nightshade) or sudakkai (Turkey Berry) Vathal or any other vathal .It is usually served with rice and papads. Today we will learn how to make sundakkai vathal kulambu following this easy recipe. Soak tamarind in approximately 3 1/2 cups of warm water and extract thick juice. Discard the pulp. 1.Heat oil (use only sesame seed oil for authentic taste ) in a heavy bottomed kadai /pan, add mustard seeds, when they splutter, add fenugreek seeds, hing, dry red chilli , curry leaves and sundakkai vathal. 2.Saute for a few minutes, then add tamarind extract, sambar powder and salt required. 3.Let it boil on medium flame until the gravy reaches a saucy consistency (as seen in the picture) and oil separates. Note- You can replace sundakkai with other vegetables like drumstick, cluster beans, brinjals,yellow pumpkin, ladies finger, broad beans,butter beans to make this spicy South Indian kuzhambu. Meet you all again with more interesting recipes, until then it is bye from Padhu of Padhuskichen. lovely traditional recipe.... it looks yummy. traditional recipe... it looks yummy..
Looks great,simply delicious. I tasted this this recipe in Coimbatore. Thanks for remind me this yummy... recipe. This is one of my favorite combo with Thayir Sadam. Thanks for visiting my blog and leaving your comments, I love it here. this and dal rice rockzz....especially the drumstick one!!!! This really looks great! I love the curry and rice together.. a wonderful combination. I so love this and amazing it looks padhu..
Yummy looking dish - totally new recipe for me. Looks great. Any chilli powder involved in the recipe? Or, just the Sambar powder enough? Awesome Padu !! ...Onion Vatha Kuzhambu with Ghee and Rice & Fried Papad ... vow what a combo ...goes well as side dish with Curd Rice as well !!!! My kozhambu doesnt thicken. Although the taste its fine. How do I ensure it does? 1. you have to cook for some more time. 2.The tamarind extract should not be too watery. To get thick kulambu first fry sundakkai in little oil and keep aside. Half of this fried sundakkai you pound it and keep it aside. Other half you put as regular after frying. When the Kulambu comes to a 3/4th consistency now add this pounded sundakkai powder and now add a one teaspoon of ghee in to the kuzambu and close the lid. This kulambu can be kept for a week but when you want to use dont't heat the kulambu in full burner but keep it in sim burner and just heated and can be had with curd rice and side licking. 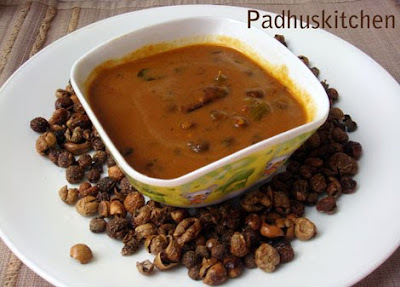 Hi padhu Your dishes are awesome.. very simple, clear and crisp.. Can you please post about sundakkai recipies like sundakkai poriyal or chutney..?? Thank you!!!!! Hi padhu i tried this recipe.. and my vatha kozhambu came out really watery and toooo sour. I think my tamarind water was too watery but what shd i do to make it less sour? The only mistake you can do in vatha kuzhambu is to add more tamarind. The sourness of tamarind differs according to the tamarind used. You can use less tamarind next time. If you can get it, use old tamarind for vathal kuzhambu. Another thing is that the tamarind extract should not be too watery nor too thick. Boil for some more time. I love all your kuzhambu recipes! very authentic! great blog! I've been dying to get my hands on a fairly easy Vathal Kuzhumbu recipe (since my Tam-Brahm) friend introduced me to it. Where can I find turkey berries or the other vathal in the US? I do not know about US. Try in Indian stores. If you want more, increase the tamarind and adjust the sambar powder, oil and salt accordingly. You can also double this recipe. This kulambu stays good for a week in the refrigerator. You cannot do anything about it. Next time when you prepare, keep that in mind. Or you can make another batch without salt and mix both.